His research work is focused on Bio-MEMS, Bio-NEMS and Biomedical Engineering using multidisciplinary approaches to develop innovative solutions for biological application and public health especially cancer cell detection. He has plentiful experience of micro and nano-fabrications at clean-rooms such as one in HKUST. He has filled several US patents on detection of circulation tumor cells in cancer patient’s blood using microfluidic technology and on electroporation of cancer cells on nano-structures for bio-molecules delivery at low voltages. Now a days, he is working on the development of low-cost impedance based sensor for cancer cell detection using nano-structures. Dr. Kashif Riaz was born and grew up in Bahawalpur, Pakistan. 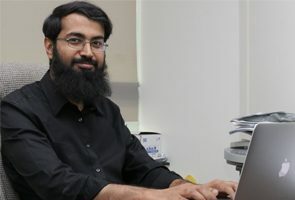 After receiving his BS degree in Electronic Engineering in 2008, he started his MS from Ghulam Ishaq Khan Institute of Science and Technology (GIKI) in 2009 under the project “Development of Open Source Cell Library for MEMS Components Verified through Modeling and Simulation” funded by National ICT R&D Projects under ministry of IT, Pakistan. During his MS, he worked on design, modelling, simulation and characterization of MEMS devices like gyroscopes, accelerometers, micro-grippers etc. After completion of his MS in 2011, he joined Faculty of Electronic Engineering, GIKI as a Lecturer. In 2012, he got PhD scholarship from Hong Kong University of Science and Technology (HKUST) and completed his PhD from HKUST in 2016. During PhD, his research focus was design, modelling, simulation and characterization of nano-structures for biological application like drug delivery, cancer cell killing, protein extraction from cells and cancer cell detection using electrical methods at low voltages. Li Zhang, Amy GW Gong, K. Riaz et al, “A novel combination of four flavonoids deriving from Astragali Radix relieves the symptoms of cyclophosphamide-induced anemic rats,” FEBS Open Bio, 2016, DOI: 10.1002/2211-5463.12146. K. Riaz et al, “Active Gap Reduction in Comb Drive of Three Axes Capacitive Micro Accelerometer for Enhancing Sense Capacitance and Sensitivity,” Microsystem Technologies, Vol. 21, pp. 1301-1312, 2015. K. Riaz et al, “Fabrication Imperfection Analysis of Robust Decoupled 3-DoF Non-Resonant MEMS Gyroscope,” International Journal of Scientific & Engineering Research, Vol. 4, pp. 686-694, 2013. A. Mirza, K. Riaz et al, “Design, Modeling and Simulation of CMOS-MEMS Piezoresistive Cantilever Based Carbon Dioxide Gas Sensor for Capnometry,” Advanced Materials Research, Vol. 403-408, pp. 3769-3774, 2012. K. Riaz et al, “Design, Damping Estimation and Experimental Characterization of Decoupled 3-DoF Robust MEMS Gyroscope,” Sensors and Actuators A, Vol. 172, pp. 523-532, 2011. K. Riaz et al, “Low-Cost Energy-Efficient 3D Nano-spikes based Electric Cell Lysis Chips,” IEEE Journal of Microelectromechanical Systems, Vol. 26, pp. 910-920, 2017, K. Riaz et al, “Electric field enhanced 3D scalable low voltage nano-spike electroporation system,” Sensors and Actuators A Physical, 2016, DOI: http://dx.doi.org/10.1016/j.sna.2016.12.022. Sohail Abdul Jalil, Kashif Riaz, Muhammad Qasim Mehmood et al, “ Fabrication of high refractive index TiO2 films using electron beam evaporator for all dielectric metasurfaces," Mater. Res. Express, Vol. 5, 016410, 2018. K. Riaz et al, “Electric field enhancement of 3d nano-spikes devices for energy efficient biological manipulations,” in 20th Annual Conference of Hong Kong Society of Theoretical and Applied Mechanics (HKSTAM) in conjunction with The 12th Shanghai–Hong Kong Forum on Mechanics and Its Application, Hong Kong, 2016, p. 44. K. Riaz et al, “Highly energy-efficient nano-spike electric protein extraction (ns-epex) chips for eukaryotic cells,” in 19th International Conference on Miniaturized Systems for Chemistry and Life Sciences (MicroTAS), Gyeongju, Korea, 2015. K. Riaz et al, “Low-cost Nano-spike Bio-Impedance Sensor (NBIS) without surface functionalization for detection and phenotyping of cancer cells,” in 18th International Conference on Solid-State Sensors, Actuators and Microsystems (TRANSDUCERS), Alaska, USA, 2015, pp. 367–370. K. Riaz et al, “Optimization of multiple-pulse ultra-low voltage Nanospike electroporation chips using feedback system control for efficient delivery of molecules to cancer cells,” in 10th IEEE International Conference on Nano/Micro Engineered and Molecular Systems (NEMS), Xi’an, China, 2015, pp. 263–267. H. Shagoshtasbi,K. Riaz et al, “Smartphone-based electroporator system for micro/nano electroporation chips,” in 10th IEEE International Conference on Nano/Micro Engineered and Molecular Systems (NEMS), Xi’an, China, 2015, pp. 72–75. S. Ma, K. Riaz et al, “Low-Cost Portable Polymer-based Micro Electrochemical Sensor (PMES) System for Rapid Detection of the Cordyceps Sinensis,” in 19th International Conference on Miniaturized Systems for Chemistry and Life Sciences (MicroTAS), Gyeongju, Korea, 2015, p. 1734. K. Riaz et al, “An Aluminum Nano-Spike electroporation chip for low voltage delivery of molecules to cancer cells,” in 9th IEEE International Conference on Nano/Micro Engineered and Molecular Systems (NEMS), Hawai, USA, 2014. K. Riaz et al, “Aluminum Nano-Spike Electric Cell Lysing with Ultra-low Applied Voltages,” in 7th Asia-Pacific Conference on Transducers and Micro/Nano Technology (APCOT), Daegu, Korea, 2014. H. Shagoshtasbi, K. Riaz et al, “Energy Profile of Single Electropore Formed During the Electroporation on the Lipid Bilayer of the Cell Membrane,” in Proceedings of the 18th Annual Conference of Hong Kong Society of Theoretical and Applied Mechanics (HKSTAM), Hong Kong, 2014, p. 19. M. U. Mian, K. Riaz et al, “MEMS 3-DoF Gyroscope Design, Modeling and Simulation through Equivalent Circuit Lumped Parameter Model,” in Proceedings of the 23rd Scientific Conference of Microscopy Society Malaysia (SCMSM), Malaysia, 2014, p. 020025-1- 020025-6. Research Scholarship for PhD at Hong Kong University of Science and Technology, Hong Kong. Awarded Scholarship in “International Coventor & MANCEF MEMS Research Competition, USA, 2010” . Selected as graduate research assistant under project “Development of Open Source Cell Library for MEMS Components Verified through Modeling and Simulation” funded by National ICT R&D projects under ministry of IT, Pakistan. Fellowship for MS Electronic Engineering at GIK Institute of Engineering Sciences & Technology, Pakistan. Merit Based Full Scholarship during BS Electronic Engineering. Distinction in MS in Electronic Engineering. Gold Medal and 1st Position in BS in Electronic Engineering. Awarded the collaborative grant for the project titled:” Towards the Development of Stable and Efficient Perovskite Solar Cells for Next Generation Emerging Technologies” by Qatar University as PI. The project will be lead by Dr. Zubair Ahmed from Qatar University. The approved funds for year 1 is QR 149,799 valid from 14/01/2018 until 31\12\2018. Funding of Year 2 is subject to the performance and progress report. Awarded the collaborative grant for the project titled:” Towards the Development of Stable and Efficient Perovskite Solar Cells for Next Generation Emerging Technologies” by Qatar University as PI. The project will be lead by Dr. Zubair Ahmed from Qatar University.The approved funds for year 1 is QR 149,799 valid from 14/01/2018 until 31\12\2018. Funding of Year 2 is subject to the performance and progress report.